Earn up to 950 Points Points. The hybrid protection system combines a padded outer soft shell and an integrated frame stand compatible with both quick release and thru axle skewer systems. While the internal Frame Defender protects your bike from impacts, it also doubles up as a bike stand. Advanced protection features include a smart belt system that holds your bike frame firmly in place as well as rigid protection shields to protect the bike’s most critical areas and fragile parts. The upright position of the bike, ¾ length zipper around the bag and individual internal wheel pockets mean customs and security personnel can inspect your bike without having to remove it from the bike bag. While a TSA padlock protects provides added security – only allowing access to TSA agents. Minimal disassembly of your bike. All that you need to remove are the bike’s wheels. Complementing a good bike fit, you don’t even have to remove the handlebars or seat post. 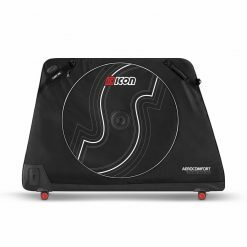 Providing better mobility, the SCICON Twin Wheel System features eight precision ball bearing wheels which rotate 360°, keeping your bike travel bag upright and maneuverable whatever the terrain.